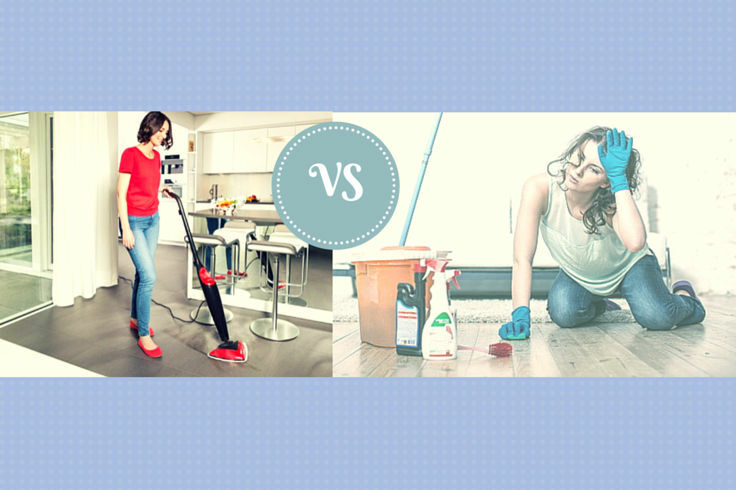 To compare a regular mop with a steam one let’s investigate what the steam mop is and how it works. Steam mops are a modern new way to sanitize, deodorize, and clean (remove dirt). The amazing thing about steam mops is they clean with just steam, and without using chemicals. New steam mops are very easy to use. They’re not complicated like rug cleaners and other industrial cleaning systems. Steam mops can usually be used on various surfaces, including carpets, hardwood, laminate, vinyl, and stone tile. Fill the steam mop water reservoir. Just like with a kettle, it’s recommended to use clean filtered water. Put the steam mop pad on the mop head. The pad usually sticks on. Plug in the steam mop. It can take 1 to 3 minutes for it to heat up fully, and begin to steam. Begin mopping! Push the steam mop back and forth on the floor. Especially for hard wood and vinyl, don’t hold it too long in one spot. Refill the reservoir as needed. Most steam mops can go for 10 to 20 minutes on a single tank. When finished: let it cool down, and remove the mop pad. The pads are typically machine-washable, which saves lots of money. The best way to describe a steam mop is to compare it to regular mops, the type your mother probably kept in the closet.